(TibetanReview.net, Feb26, 2015) – Chinese authorities in two counties of the Tibetan Prefecture of Tsonub (Chinese: Haixi) in Qinghai Province have banned young monks who had come home to celebrate Losar, the Tibetan New Year which began this year on Feb 19, from returning to their monasteries. They have been ordered to give up their monastic life and, instead, attend secular schools set up by the Chinese government, reported Radio Free Asia (Washington) Feb 24, citing local sources. 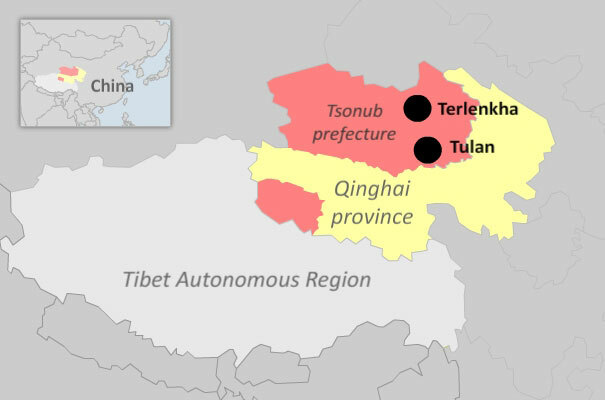 The report said the move by officials in the prefecture’s Tulan (Dulan) and Terlenkha (Delingha) counties followed similar campaigns last year in Tibet Autonomous Region aimed at restricting the size of Tibetan monasteries. Parents in these two counties were called to a meeting on Feb 23 and told that young monks currently studying in distant monasteries will not be allowed to return there, the report cited a local source as saying, speaking on condition of anonymity. The parents were ordered to take their children as laypeople to the local schools to be enrolled there when they reopen after the winter holiday season comes to an end. In these schools even Tibetan language is not taught, not even as a subject, the report added. The move is seen to especially target monks from rural nomadic areas who are under 19 years of age. The government’s move seem to be amplified by the fact that Tibetan language classes organized by concerned private individuals and groups for students who have already graduated from local schools have now also been banned. The report noted that in October last year, Chinese authorities in Driru (Biru) County of Tibet Autonomous Region, had expelled from monasteries and returned home monks who were 12 years old or younger.